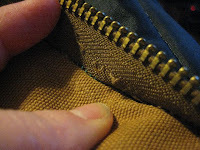 Using a single sided razor blade to cut the threads will get these zippers out pretty quick. 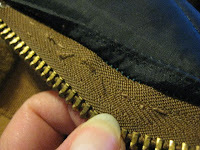 You'll still have loose threads to pick out, but total time getting the old zipper out shouldn't take more than 10-15 mins. with practice. 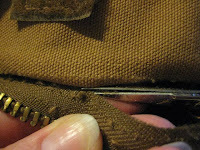 Be sure to use a new blade because the threads are very coarse and a dull blade won't cut as easy. Thanks, Pam. 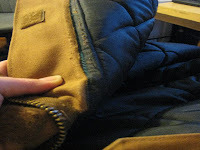 I do use a utility knife for a lot of my ripping, but these threads were so imbedded I was afraid of nicking the outer fabric. You're right, though. It does make the job go much quicker! I called Carhartt and they mailed me a zipper for free. Just needed to know some specifics on the coat that it was for. I am in Cincinnati, OH and we have a notions warehouse called Banasch's. That's where I go. They do ship, though and their prices are reasonable. You could also try Wawak or Sewtrue for wholesale supplies. Clotilde and Nancy's Notions are retail suppliers. Does any one elas have a suggestion? A customer just brought me his Carhartt jacket last night along with the zipper he received from Carhartt for free! I did not realize they would send a replacement zipper.